A destination is the end point of a link or a bookmark in a PDF document. It is represented by text in the "Destinations" pane of Adobe® Acrobat®. Destinations allows setting navigational paths across a collection of PDF documents. Using named destinations is recommended when linking across multiple documents, because unlike linking to a page, linking to a destination is not affected by page addition or deletion in a single document. AutoBookmark™ named destinations can be used to open a PDF document from HTML script "href" tag at a desired place. Manually creating named destinations is a time consuming and tedious task. The AutoBookmark™ set of functions helps to solve this problem quickly and efficiently. Destinations are automatically generated from existing bookmarks and bookmarks are converted to use named destinations instead of direct page references. Named destinations enable you to set navigation paths across a collection of PDF documents. Linking to a destination is recommended when linking across documents, because unlike a link to a page, a link to a destination is not affected by the addition or deletion of pages within the target document. Named destinations can be also shared between multiple links or bookmarks within a document. For example, instead of using a direct link to page 10, a bookmark will point to the named destination "Chapter 1" . You will be able to link to this location using a human-readable name instead of a page number. Custom text patterns (using regular expression syntax) can be used to search and extract only a portion of bookmark title for use as a destination name. Convert link actions to use "named" destinations instead of direct references to a page. The plug-in automatically creates a separate named destination for each link annotation that points to a page and converts it to use this destination instead of the direct page reference. Named destinations enable you to set navigation paths across a collection of PDF documents. Linking to a destination is recommended when linking across documents, because unlike a link to a page, a link to a destination is not affected by the addition or deletion of pages within the target document. Named destinations can be also shared between multiple links or bookmarks within a document. For example, instead of using a direct link to page 10, a link can point to the named destination "Chapter 1" . You will be able to link to this location using a human-readable name instead of a page number that can potentially change over time. 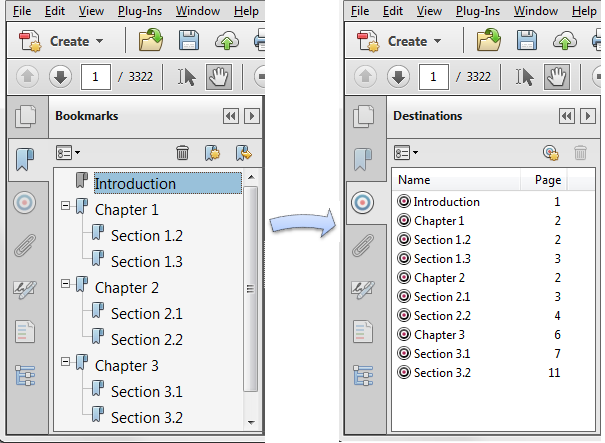 Automatically create destinations based on Bates numbers for each page in the PDF document. This operation checks every page for a Bates number and creates a destination pointing to this page while using a Bates number as a name. Once the document has destinations that match Bates numbers, then it is possible to bookmark/link to the pages by using a corresponding destination name. The advantage of destinations is that they can be used for cross-document linking. The links/bookmarks that use destinations do not need to be updated if the page order or page count has been changed. 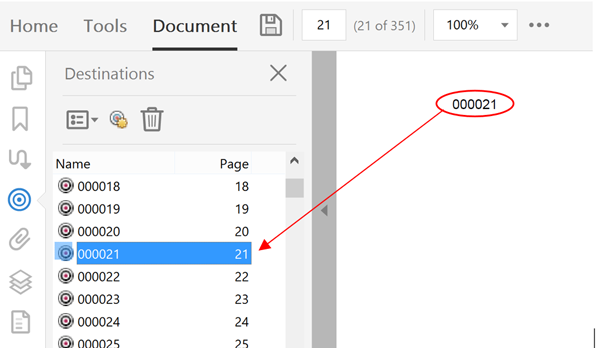 Automatically create page labels based on Bates numbers for each page in the PDF document. This operation checks every page for a Bates number and sets a page label to use this number. Page labels are used to identify pages in "Thumbnail" panel and in the page selector. After applying this operation it is possible to jump to a page by typing a corresponding Bates number. Create named destinations from a tab-delimited ASCII text file. You can either use a text file that was previously exported using the "Export To Text" operation or create your own file using a simple text format. The minimum requirement is to provide just two parameters for each destination: a unique name and a destination page number. This functionality can be used for transferring named destinations between files, creating new or editing existing destinations. It is not possible to create a destination that points to a page that does not exists in the current document (i.e. document has just 100 pages, but the destination tries to refer to page number 101). The plug-in provides ability to import named destinations into multiple PDF documents from different document-specific text files. This operation expects that each PDF document has an associated text file with the same name but with *.dest.txt extension. The software allows converting links and bookmarks that already use named destinations to direct page links. The actions are adjusted to point to the same locations as named destinations, but without using them. All named destinations can be deleted from a document at once. • Only one digit following a decimal point is retained for float values. • Individual parameters, together with their values (separated by & or #), can be no greater then 32 characters in length. • You cannot use the reserved characters =, #, and &. There is no way to escape these special characters. 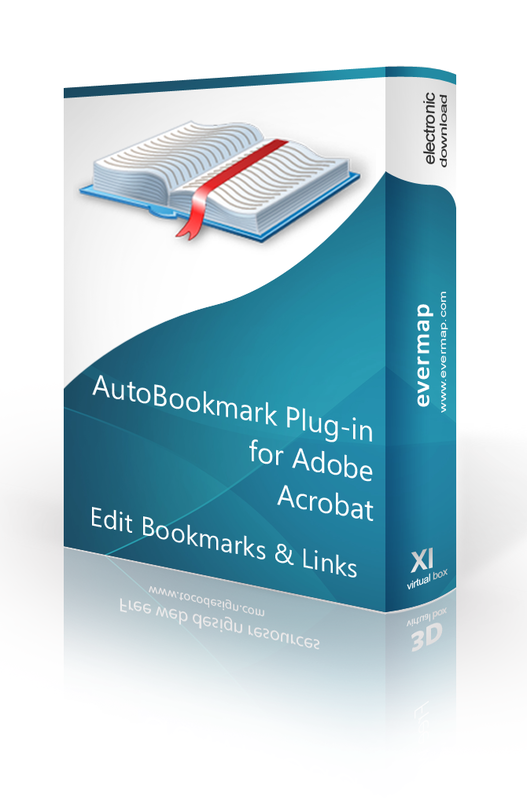 • If you turn bookmarks off using a URL parameter when a document had previously been saved with bookmarks on, the bookmark scrollbars are displayed at first, and only disappear once Acrobat obtains enough streamed information to render the full page.